Volunteer Teachers are those professionals who are not paid for their teaching services. 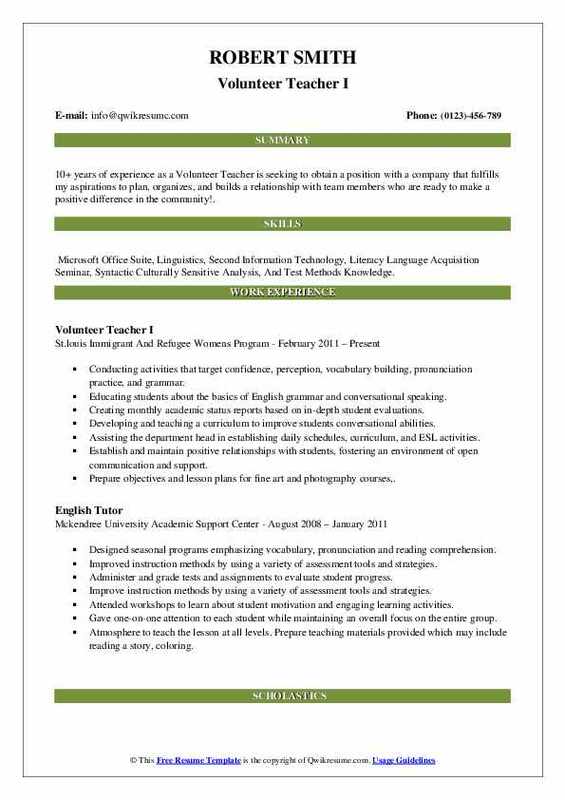 The job description for this post varies widely based on job setting and education process, but some of the common tasks that can be seen on successful Volunteer Teacher Resume includes – offering instruction or teaching to small or large group of people or students; engaging children in interactive and enjoyable experiences, preparing and executing lesson plans, assigning tasks to students, conducting regular assessment through tests, homework and projects; grading the student performance and participating in continuous education process. Eligible candidates willing to deliver such noble service are expected to possess abilities like – strong teaching experience, familiarity with various disciplines, leadership and communication skills, the ability to motivate and mentor students in the right path and work dedication. 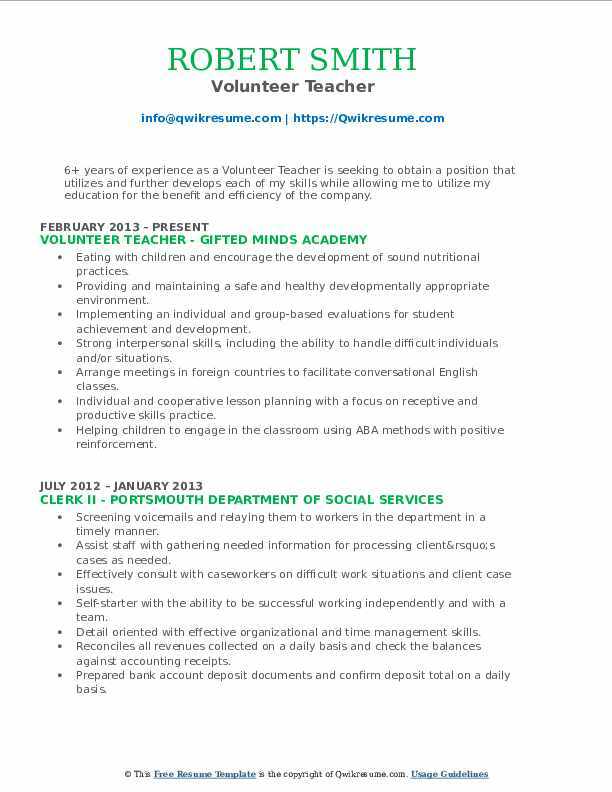 Along with a Degree, education training and experience are commonly seen on the resumes. Summary : 14+ years of experience as a Volunteer Teacher. Self-directed, enthusiastic, dedicated and progressive professional educator with a passion for teaching and a commitment to the intellectual and social development of children. 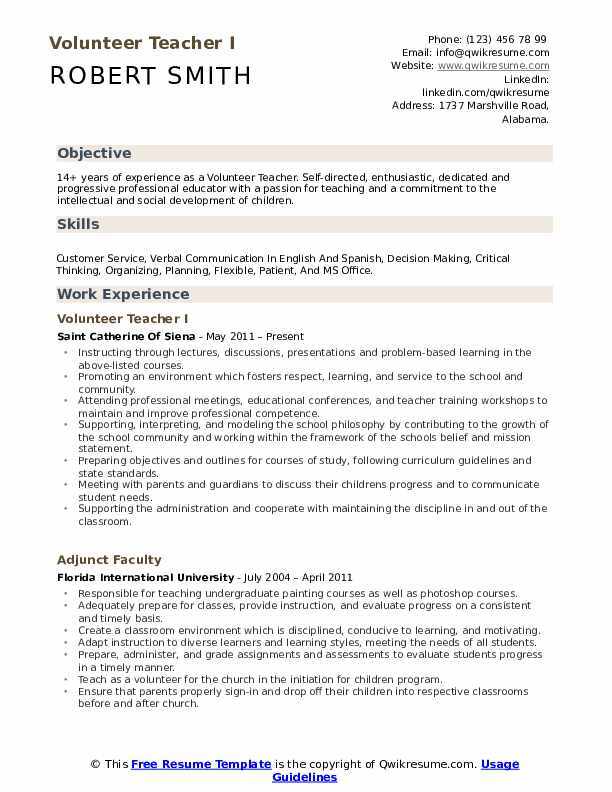 Skills : Customer Service, Verbal Communication In English And Spanish, Decision Making, Critical Thinking, Organizing, Planning, Flexible, Patient, And MS Office. Instructing through lectures, discussions, presentations and problem-based learning in the above-listed courses. Promoting an environment which fosters respect, learning, and service to the school and community. Supporting, interpreting, and modeling the school philosophy by contributing to the growth of the school community and working within the framework of the schools' belief and mission statement. Preparing objectives and outlines for courses of study, following curriculum guidelines and state standards. Meeting with parents and guardians to discuss their children's progress and to communicate student needs. Supporting the administration and cooperate with maintaining the discipline in and out of the classroom. Summary : 7 years of experience as a Volunteer Teacher. An accomplished, results-oriented business professional with experience in human resources, account management, social work, and administrative services. 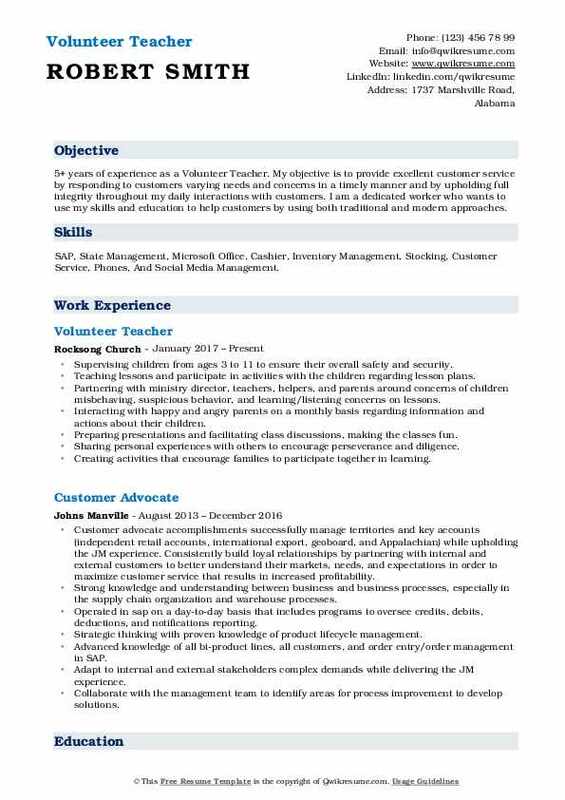 Skills : Customer-savvy, Proficient in Microsoft Word, Excel, Excellent Research Skills, Excellent Presentation/Reporting Skills, Fluent in English, Swahili, and Luganda (Native Language). Extensive training through AmeriCorps on the processes of resettlement, naturalization, and deportation. Familiar with the issues surrounding the refugee and immigrant communities. Designed curriculum to support all educational backgrounds and a variety of special needs. Designed a supportive, successful education department without a budget. In charge of marketing to other organizations and to the outside communities. Provided direct services to refugee and immigrants in the community by preparing and escorting them to appointments with social service providers; assisted in translating English as needed. Organized community education and health forums on various social adjustment services in an attempt to assist refugees and immigrants learn how to quickly and effectively adjust into the social-economic life in the united states. Educated youth by coordinating with school authorities and their parents who do not possess basic education. Recruited volunteers in the refugee and immigrant communities to develop their skills in working with clients and assist the organization in meeting goals. 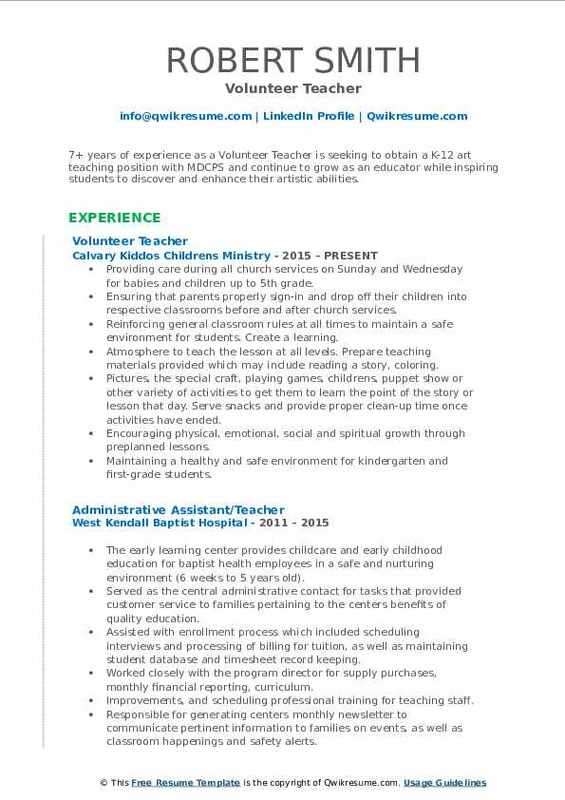 Summary : 10+ years of experience as a Volunteer Teacher is seeking to obtain a position with a company that fulfills my aspirations to plan, organizes, and builds a relationship with team members who are ready to make a positive difference in the community!. Skills : Microsoft Office Suite, Linguistics, Second Information Technology, Literacy Language Acquisition Seminar, Syntactic Culturally Sensitive Analysis, And Test Methods Knowledge. Conducting activities that target confidence, perception, vocabulary building, pronunciation practice, and grammar. Educating students about the basics of English grammar and conversational speaking. Creating monthly academic status reports based on in-depth student evaluations. Developing and teaching a curriculum to improve students conversational abilities. Assisting the department head in establishing daily schedules, curriculum, and ESL activities. Establish and maintain positive relationships with students, fostering an environment of open communication and support. Prepare objectives and lesson plans for fine art and photography courses,. Providing positive atmosphere in a room that promotes healthy emotional and social development for children. Summary : 7+ years of experience as a Volunteer Teacher is seeking to obtain a K-12 art teaching position with MDCPS and continue to grow as an educator while inspiring students to discover and enhance their artistic abilities. Skills : Microsoft Office, Customer Satisfaction, Management, Quickbooks, Cashier, Inventory Management, Stocking, And Customer Service. Providing care during all church services on Sunday and Wednesday for babies and children up to 5th grade. Ensuring that parents properly sign-in and drop off their children into respective classrooms before and after church services. Reinforcing general classroom rules at all times to maintain a safe environment for students. Create a learning. Atmosphere to teach the lesson at all levels. Prepare teaching materials provided which may include reading a story, coloring. Pictures, the special craft, playing games, children's, puppet show or other variety of activities to get them to learn the point of the story or lesson that day. Serve snacks and provide proper clean-up time once activities have ended. Encouraging physical, emotional, social and spiritual growth through preplanned lessons. Maintaining a healthy and safe environment for kindergarten and first-grade students. Summary : 12+ years of experience as a Volunteer Teacher is now looking to obtain a position as an Elementary School Teacher in which a strong dedication to the total development of children and a high degree of enthusiasm can be fully utilized. Skills : MS Office Tools: Microsoft Excel, Microsoft Word, Microsoft PowerPoint Scripting Tools: VBA Databases: Microsoft Access Operating Systems: Windows 2007, 2003, XP CRM: SalesForce Team Collaboration Tools: Microsoft SharePoint, And EDMS. Making a lasting imprint on a child's life by helping them to learn a native language and understand various cultures. Developing, plan and implement a language curriculum for youth classes and workshops. Providing a safe, wholesome and comfortable environment for participants. Tracking and report program-related records, i.e., program evaluations, participant attendance. Providing work direction to the teaching assistant(s) and volunteers as needed. Currently assisting a middle school teacher in teaching English to Italian students. Demonstrating family values by taking the entire family on the trip and socializing with other families. Headline : 5+ years of experience as a Volunteer Teacher. My objective is to provide excellent customer service by responding to customers varying needs and concerns in a timely manner and by upholding full integrity throughout my daily interactions with customers. I am a dedicated worker who wants to use my skills and education to help customers by using both traditional and modern approaches. Skills : SAP, State Management, Microsoft Office, Cashier, Inventory Management, Stocking, Customer Service, Phones, And Social Media Management. Supervising children from ages 3 to 11 to ensure their overall safety and security. Teaching lessons and participate in activities with the children regarding lesson plans. Partnering with ministry director, teachers, helpers, and parents around concerns of children misbehaving, suspicious behavior, and learning/listening concerns on lessons. Interacting with happy and angry parents on a monthly basis regarding information and actions about their children. Preparing presentations and facilitating class discussions, making the classes fun. Sharing personal experiences with others to encourage perseverance and diligence. Creating activities that encourage families to participate together in learning. 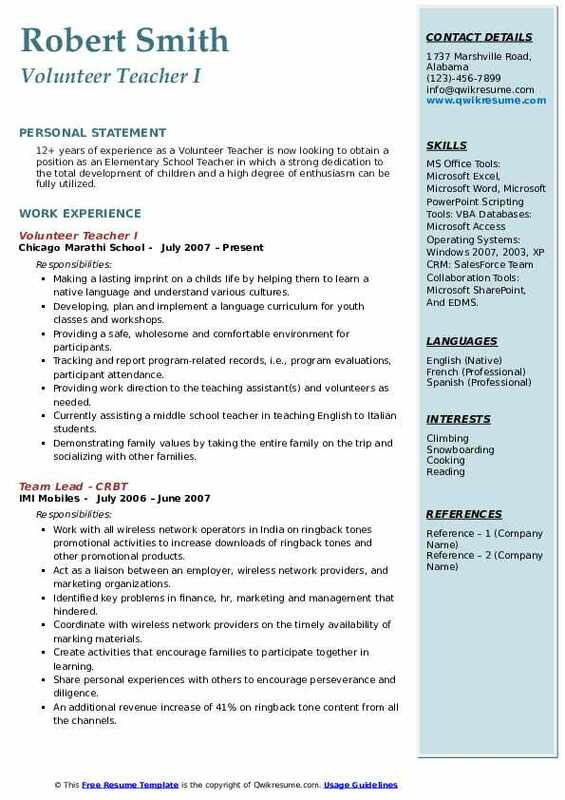 Headline : 6+ years of experience as a Volunteer Teacher is seeking to obtain a position that utilizes and further develops each of my skills while allowing me to utilize my education for the benefit and efficiency of the company. Skills : Cashier, Inventory Management, Stocking, Customer Service, Phones, And Social Media Management. Eating with children and encourage the development of sound nutritional practices. Providing and maintaining a safe and healthy developmentally appropriate environment. Implementing an individual and group-based evaluations for student achievement and development. Strong interpersonal skills, including the ability to handle difficult individuals and/or situations. Arrange meetings in foreign countries to facilitate conversational English classes. Individual and cooperative lesson planning with a focus on receptive and productive skills practice. Helping children to engage in the classroom using ABA methods with positive reinforcement. Headline : 5+ years of experience as a Volunteer Teacher. I am seeking to teach online or in person and assist with meeting students goals of communication, confidence, and fulfillment in the English language. 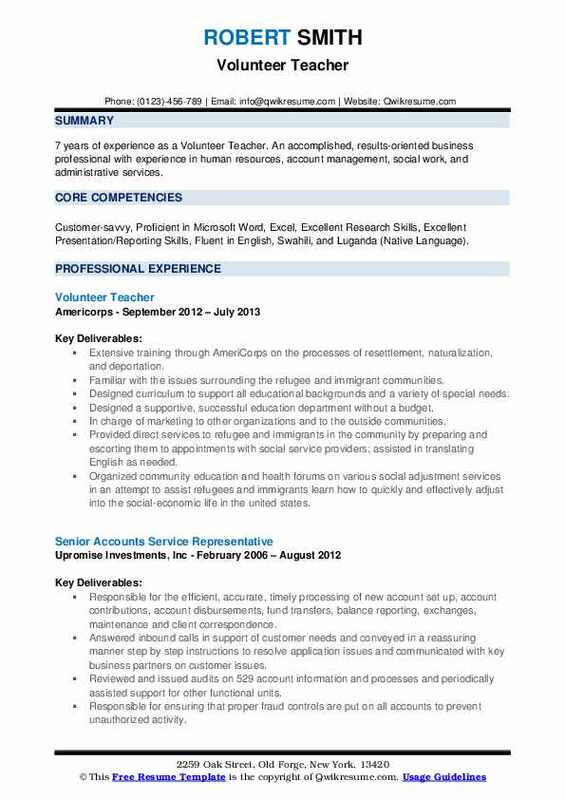 Skills : Administrative Assistant And Document Controller; English-Vietnamese Translation, Community Outreach, Website Design, And Vice Versa. Planning and executing new topic each week in speaking, reading, writing, and grammar. Facilitate learning games and activities on topics such as literature and current events. One on one support for children with special needs as they join their peers learning and growing. Organizing and implementing lesson plans to meet comprehension, literacy, and conversational goals using Microsoft Powerpoint, and Microsoft word. Directly experience the urgent need of material help and educational resource of. Students in the hope primary school, which aroused my desire to change the current condition of NGOs. Developing a program to work with students and increase interest in higher learning. 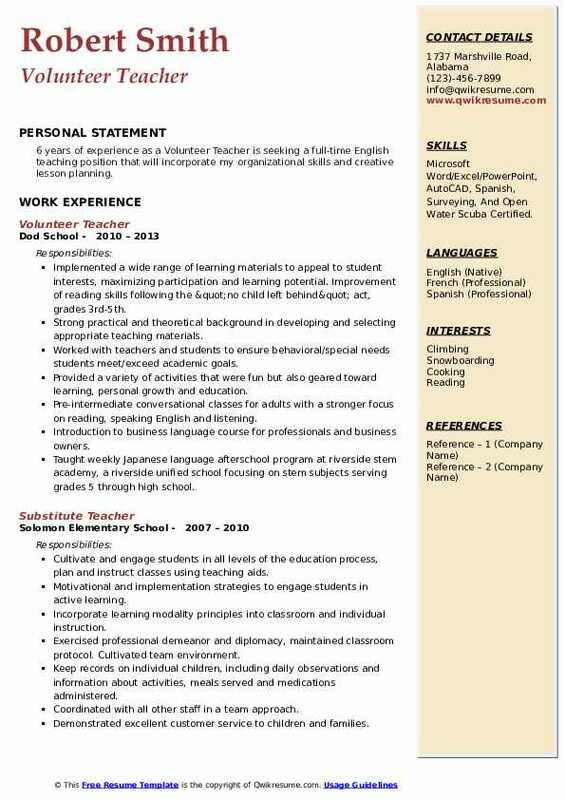 Headline : 6 years of experience as a Volunteer Teacher is seeking a full-time English teaching position that will incorporate my organizational skills and creative lesson planning. Skills : Microsoft Word/Excel/PowerPoint, AutoCAD, Spanish, Surveying, And Open Water Scuba Certified. Implemented a wide range of learning materials to appeal to student interests, maximizing participation and learning potential. Improvement of reading skills following the "no child left behind" act, grades 3rd-5th. Worked with teachers and students to ensure behavioral/special needs students meet/exceed academic goals. Provided a variety of activities that were fun but also geared toward learning, personal growth and education. Pre-intermediate conversational classes for adults with a stronger focus on reading, speaking English and listening. Introduction to business language course for professionals and business owners. Taught weekly Japanese language afterschool program at riverside stem academy, a riverside unified school focusing on stem subjects serving grades 5 through high school. 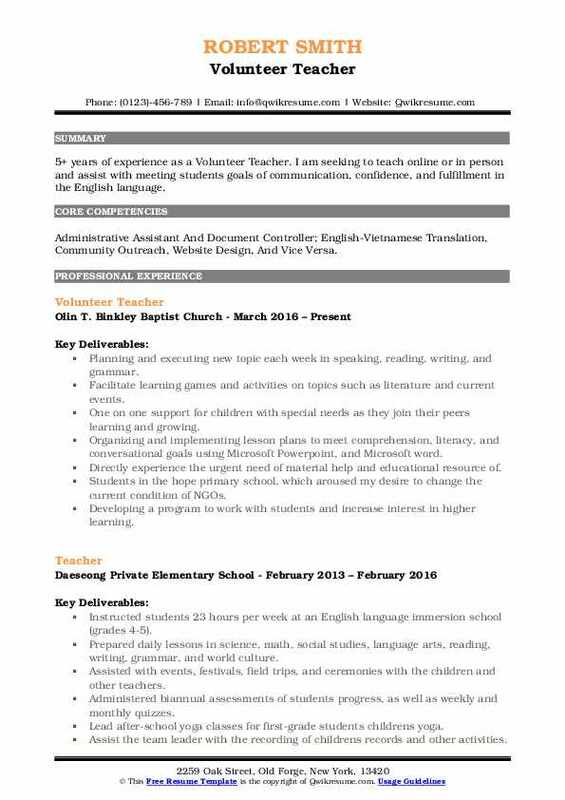 Objective : 4 years of experience as a Volunteer Teacher is seeking to gain an employment with a growing company that offers me a consistently positive atmosphere to bring my strong dedication, responsibility, and motivation for the betterment of the organization. 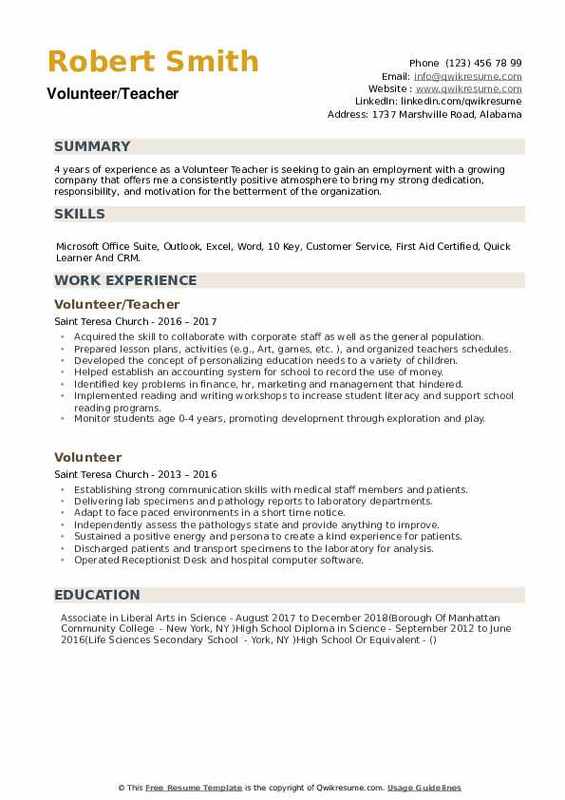 Skills : Microsoft Office Suite, Outlook, Excel, Word, 10 Key, Customer Service, First Aid Certified, Quick Learner And CRM. Acquired the skill to collaborate with corporate staff as well as the general population. Prepared lesson plans, activities (e.g., Art, games, etc. ), and organized teachers schedules. Developed the concept of personalizing education needs to a variety of children. Helped establish an accounting system for school to record the use of money. Identified key problems in finance, hr, marketing and management that hindered. Monitor students age 0-4 years, promoting development through exploration and play. Prepare and teach character development lesson plans to students age 5-10 years.